Nestled amidst the magnificent snow-clad mountains of the Garhwal Himalayan Range is Auli which adds to the beauty of Uttrakhand and is regarded as one of India’s best skiing destinations. 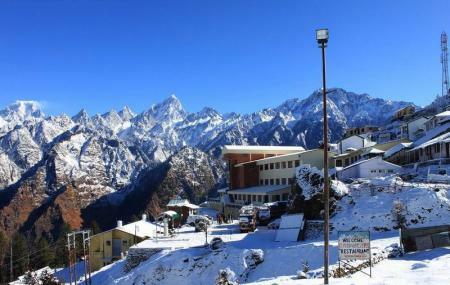 With meadows and slopes that are flanked by lush vegetation of coniferous and oak, the beauty of Auli is truly inexplicable. Panoramic views of the majestic Himalayan peaks, natural vistas, lush wooded vegetation and the pathways that remain laden with colourful wildflowers make Auli a must-visit place when in Uttarakhand. Apart from the uncountable natural attractions, there are also several adventure and fun activities that the tourists can choose to engage in. excellent spot for ice skiing. Good facilities having a bar and eatary with few regional cuisine only. Not good to stay more than 2 days if you are not on skiing training tour. Great location. Wonderful view of the peaks all around. Chair lift just next to it, so very convenient. Situtated in lush green environment. One of the best government rest houses I've ever been to. The way it is built will astonish you. I loved stating there. Scenic place especially if you are fond of Mountains and snow. Chairlift is a bit risky but still an adventurous experience. Rope way is I believe the best medium to reach from Joshimath. Do ensure you book the tickets in advance. The best part is the artificial lake of course. However going by road from Delhi is a lot time taking that too when you plan for a short stay in this area. Good hotel with good heaters (AC) per room. Food also good. Service is bit slow I felt , may be due to lots of requests.